Dating from 1903, the top postcard is very similar to the previous image. Here the shopkeeper (presumably Harry William Barnwell) is standing outside the door of the watchmaker's shop which is on the left hand corner of the road. He is wearing a long white apron. A woman in a hat, green skirt and cream coloured blouse and carrying a folded parasol has paused outside the Queen's Head Hotel on the right of the picture, perhaps at the request of the photographer. 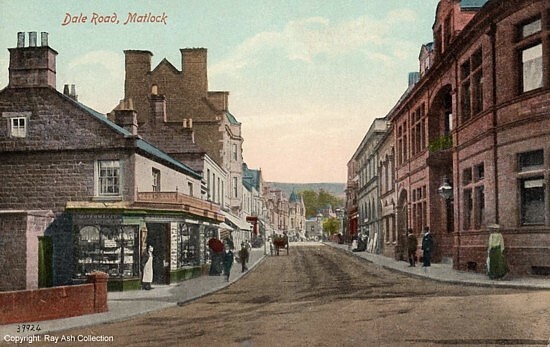 In 1903, when the postcard was first published, the Hotel was the headquarters of Matlock and District Canine Society. Various clubs and organisations held their annual dinners there that year including F Company of the 2nd Sherwood Foresters and Matlock Football Club. The firm of Joseph Hodgkinson also held auctions at the Queen's Head. Half way down Dale Road on the left hand side is an open carriage, travelling away from us and towards Matlock Bath. Almost directly opposite it is the Market Hall building, with some wares stacked against one of the shop fronts. This postcard was addressed to Mr C Wardman, Farmer, Horse Dale, Bonsall and was posted at Matlock. In the days before using telephones became commonplace, writing letters and postcards was the fastest way to communicate, with same day delivery locally as shown by the very unusual message! "Sending churn up tonight Friday on bus leaving Matlock at 6.35. Fill to top. Take no notice of the Post Card". We can also see, on the left part, of a parapet wall that was attached to the County Bridge. In 1928 the steering gear of a heavy steam lorry laden with tarmacadam and belonging to Messrs Greatorex and Son had failed at this point. It was being driven from the station and crashed through both the wall and railings that were fixed on to part of it1]. 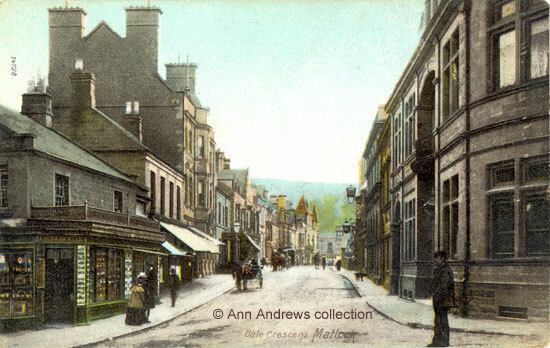 Instead of replacing the railings and the wall it was decided to build a substantial buttress next to the shop, then the chemist's shop of Mr. A. E. Davis, and set the parapet wall somewhat further back from the road. This work was undertaken in 1929. A very slightly different view of Dale Road, called Dale Crescent here. It is of a similar date. the 'correct' side of the road. 1. "Dale Road, Matlock". Valentine's Series postcard, no. 39924. British Manufacture. The original black and white / sepia version of this card was registered by Valentine in July 1903. Posted, but date unreadable. The stamp is a George V one penny, printed between 1912 and 1924. 2. "Dale Crescent, Matlock". No publisher, but No.74728. Posted on 28 April 1908 in Gloucestershire. © Ann Andrews collection. "Derbyshire Times", 2 June 1928. "Derbyshire Times", 4 January 1930. Matlock Improvements, No. 7.